Nathan Nankervis is a Graphic Artist, Illustrator and Designer based in Melbourne. 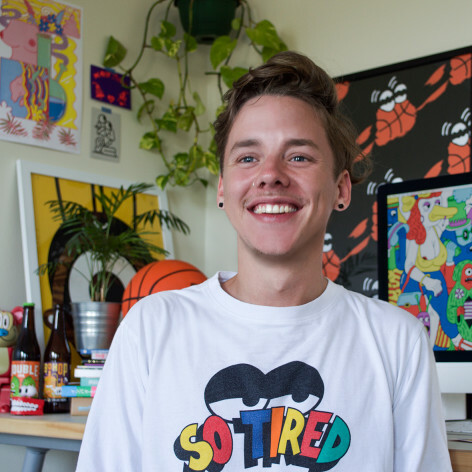 He creates bold, exuberant pieces that aim to make people smile and think. The over arching themes of fun and positivity are a reflection of Nathan’s energetic nature and manifests in his characterised approach. With a strong background in communication design, conceptual thinking is at the core of Nathan’s practice. His works are filled with simple messages, playful palettes, and energetic patterns that inspire an audience’s inquisitiveness and urge to play. Nathan has worked and continues to work with a broad array of international clients such as Heineken, Red Bull, BONDs, Xero, Strava, Little Bao Hong Kong, Swinburne University, Australian Super, Seven Seeds and The Design Files.